here’s where it gets truly concerning. In what could be construed as a calculated insult to environmentalists, the scientific community and everyone who actually cares about the future of the Great Barrier Reef, the Foundation’s “partners” make up a veritable “Who’s Who” of big business and the mining industry, including Qantas, Boeing, Rio Tinto, BHP, Peabody Energy, Shell, Downer EDI Mining, Worley Parsons, Wesfarmers and Aurizon — the very ones, arguably, responsible for the Reef becoming bleached in the first place. And the chair of the Foundation? 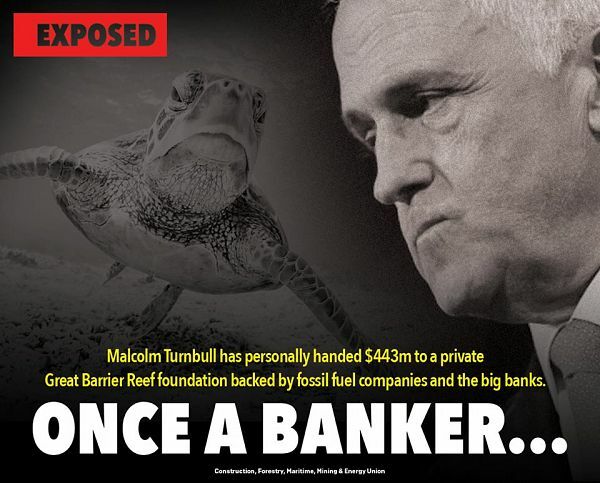 The one who was in that 9 April meeting with Turnbull and Energy and Environment Minister Frydenberg? That was former BHP director and Esso Australia CEO John Schubert. Esso is the Australian subsidiary of ExxonMobil — not only the world’s biggest oil company, but also the world’s biggest funder of climate change denial. They also sank the Exxon Valdez oil tanker off Alaska, causing one of the most devastating environmental disasters in human history — so they do have some experience dealing with damaged coastlines.